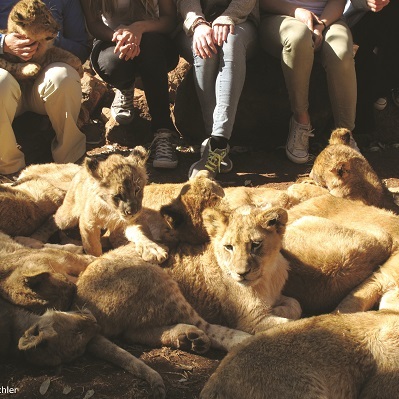 Despite widespread international condemnation, South Africa’s controversial lion breeding industry has grown year-on-year and has links to wildlife trafficking, according to a new report Cash Before Conservation: An Overview of the Breeding of Lions for Hunting and Bone Trade, published today by international wildlife charity Born Free. Africa’s lions are facing an unprecedented crisis. As few as 20,000 wild lions now occupy just 8% of their historic range. Shrinking habitats, reduced prey numbers, conflict with local people, unsustainable hunting practices, and increasing demand for lion products (particularly bones) in international trade cause many scientists to predict further devastating declines. In spite of this, in the decade to 2013 South Africa declared almost 7,500 lion trophy exports, and in 2017 the government issued an export quota for 800 lion skeletons from captive-bred lions. In addition, over the last five years South Africa has exported over 200 live captive-bred tigers, and dozens of tiger trophies, bones, claws and skulls, mostly to Asia and the Middle East. Born Free believes this trade fuels demand and puts wild lions and other big cats at even greater risk. Some of the buyers and countries to which these products are destined also have strong associations with wildlife trafficking. South Africa’s predator breeding industry has been condemned by international conservation organisations and animal welfare groups alike. The South African authorities admit that captive lion breeding has ‘limited conservation value’. Even some prominent hunting groups have publicly distanced themselves from canned hunting practices. Despite this, leading members of South Africa’s national and provincial governments have been instrumental in promoting the growth of the industry. The report uses numerous sources of information to highlight the support the industry has received from public officials. It also draws attention to links between the export of lion trophies and products from captive-bred lions and the trafficking of other wildlife products. It concludes that, if South Africa is to be regarded as a responsible and ethical custodian of its wildlife, and a country that cares about the safety and security of wildlife elsewhere in Africa and across the globe, urgent action is needed to end the captive breeding of lions, canned hunting and the sale of lion bones and skeletons into international markets. The focus should be on protecting lions in the wild.